Physical release planned for Europe. Ghost Giant, Zoink Games’ E3 2018-announced PlayStation VR title, will launch this spring, the developer announced. In Europe, a physical release is planned via publisher Perp Games. This exciting puzzle adventure filled with warmth and charm sees a lonely boy named Louis befriend a giant ghost visible only to him. As the Ghost Giant, you’ll have to carefully build trust with Louis and help him through small, big and sometimes overwhelmingly huge obstacles, discovering the true meaning of friendship along the way. As the Ghost Giant, you will get to explore the world of Sancourt, helping its citizens with all manner of day to day problems by using your size and strength. 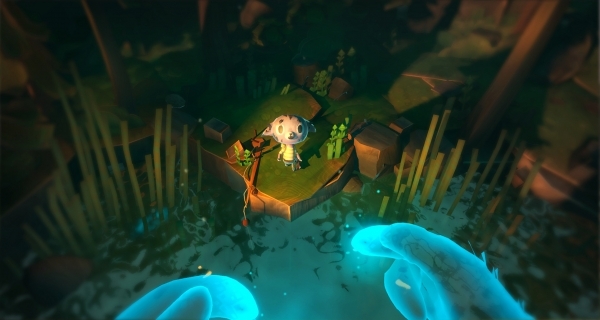 Ghost Giant offers a unique, crafty-looking dollhouse world which can be manipulated in multiple ways and is full of hidden secrets. Zoink’s aim with Ghost Giant is to recreate the feel of exploring a doll’s house in VR by lifting furniture off the roof and playing around with trinkets and furniture inside, while also giving players a purpose and sense of scale to deliver something truly special and memorable. You’re not just a manipulator from outside the screen, you’re really in there, participating in Louis’ world and being recognized by him as his friend. Ghost Giant has been written in collaboration with Swedish writer, Sara Bergmark Elfgren, who’s work has been translated into 25 different languages, and is perhaps best known for her Engelsfors Trilogy. This gives players a whole new perspective on virtual reality by pushing the boundaries of physical interaction with emotionally compelling storytelling.